1.Foundry Crane used for a specific service objects, often according to crane service object and process design special fetch device and working mechanism. 2.In order to improve the productivity of the crane, the working speed and acceleration of the crane are much higher than those of the general bridge crane. At the same time, the starting and braking of the crane mechanism are very frequent, especially the running and rotating mechanisms are often started and braking. Therefore, the motor capacity must meet the necessary acceleration requirements. 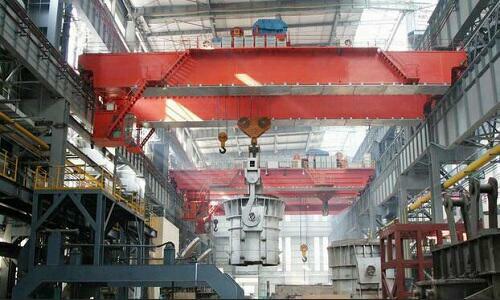 3.The working environment temperature is high, the lifting object is very big. In the selection of motor electrical control equipment, the requirements of the higher insulation components, starting current range is relatively large. 4.The Crane lifting of iron (steel) water temperature is high, the shape of the workpiece, weight, handling a wide range, large drop gap, so the crane safety measures and safety protection equipment, the periodic inspection of safety protection devices is particularly stringent.